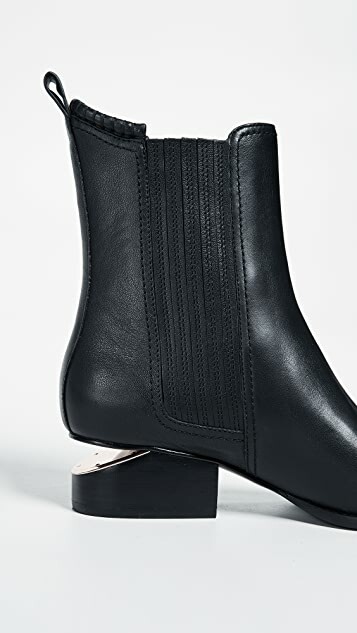 One look at the sleek silhouette of these sculptural Alexander Wang booties and it's settled: this is a pair you'll reach for all the time. With their classic design and unique sliced heel (and rose gold-tone heel plate! 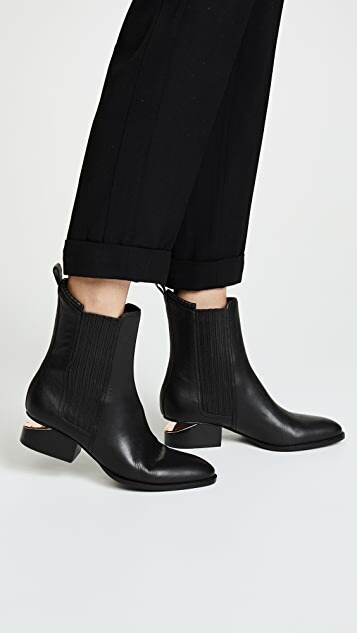 ), Anouck booties offer the signature minimalist luxury that Alexander Wang is known for. I wear these shoes every day, I love them so much I bought a back up pair...just case. I get so many compliments on these beauties! Do it, you won't regret it. I honestly have a wide feet but am size 39.5 sometime 40 EU , So i end up buying the 40 it was so hard to put it on but with thin socks it slides much better but still difficult to get it off as i had so much space in the front i straggled with the back part and the middle , hopefully i can mange to break it in the autumn ..other than that it's beautiful shoes i have tried so many narrow boots but this one made my legs looks thiner, what makes me sad i saw my friend boot after a few wear that the down part black color started getting white even though she only wear it few times ..am pretty picky person specially if am paying for expensive boots so that can last long , i highly recommend these boots but size up half size if u have wide feet . 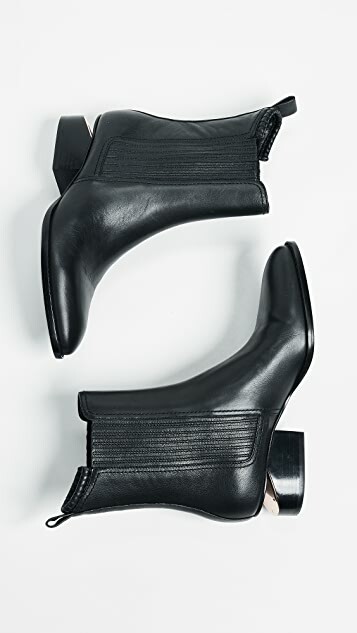 The pictures of these boots on shopbop dont do them any justice. 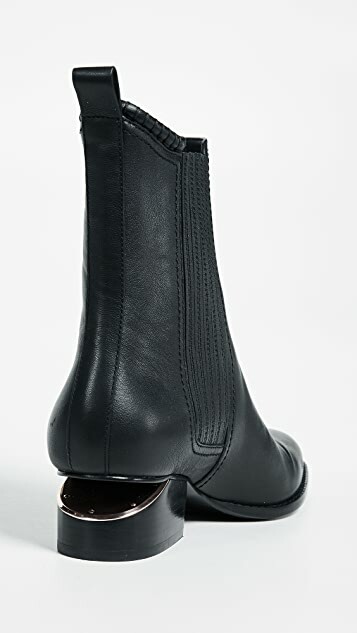 These boots are incredible on-gorgeous shape, elegant, rock chic. They are amazing with black skinny jeans tucked in-really elongate your legs visually (which is why they shouldnt have been modeled with cropped pants here). They are also ridiculously comfortable. For once I can have a great looking pair of boots I can actually spend all day walking in. I also love the height they add-although they have the vibe and feel of a flat boot the little heel they do have makes a big difference. Im usually an 8 and the 38 is perfect. PS I bought them elsewhere first as Shopbop didnt have my size and they were not nearly as soft or beautiful as I remembered-I then realized they must have come in a couple of different leathers. 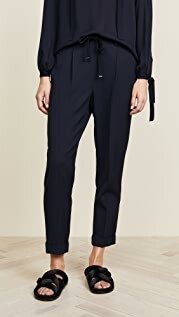 Point being-buy them on shopbop and dont try to find on sale like I did. After going through three pairs finally I got my hands on the perfect one and they couldnt be more gorgeous.